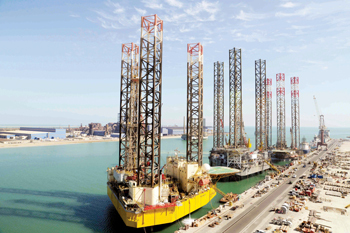 ASRY’S offshore division which specialises in rig repairs achieved 100 per cent on-time delivery of all rig projects completed in 2014, the company says. “Global clients including Saudi Aramco, Saipem, Nabors Drilling, Egyptian Drilling Company and more chose Asry for their rig repair projects last year, which totalled 17 rigs, and all took delivery of their vessels on schedule, and within budget,” an Asry statement said. Chief executive Nils Kristian Berge remarked: “With competition rising in the region rig customers are more focused on ensuring that the maintenance of their assets is completed as efficiently as possible. As such, rig operators have been increasingly turning to Asry due to our commitment to our core values, to complete each scope on-time, on-budget with top safety and quality. Asry’s offshore division has also recently seen its capabilities expand to include onshore industrial work in Saudi Arabia, with involvement in a project in Saudi called Camellia. Asry was commissioned to design procure and fabricate a significant number of stainless steel hoppers, pipe spools, valves, flanges and fittings, for a new catalysts production facility called Camellia, which is being built by Axens Catalysts Arabiya, a company specialising in process licensing and manufacture and sales of catalysts and absorbents in the fields of refining, petrochemical, gas and biofuels. Founded in 1977 in Bahrain, Asry has over 35 years of experience in marine asset optimisation. Its leading range of facilities includes a 500,000 dwt drydock, two floating docks of 252 m and 227 m in length, 15 repair berths with a total length of approximately 4,000 m, twin 255 m slipways, as well as a full range of workshops and service centres. The yard’s portfolio of capabilities is not only the largest in the Arabian Gulf, but also includes jack-up rigs and other offshore assets due to a dedicated division – Asry Offshore Services. 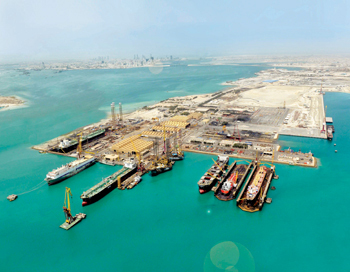 Combined with a series of other diversifications including an energy division dedicated to the production of unique power generation barges, and a consultancy division for marine engineering packages, Asry is a multi-functional marine services hub committed to providing international standards to global shipowners operating in the Arabian Gulf.